Encompassed by towering mountains, dense forests, and bubbling brooks, the village of Gaobei in Yongding County may seem like the most unlikely place to meet royalty. Yet here, hidden like a gem within the countryside, lies Chengqi Lou; the “King of Tulou”. Around the streams that wind through Gaobei, a cluster of these fortress-like earthen dwellings rises up and adds new magnificence to the landscape. They resemble fortified villages and were initially designed to protect the inhabitants from bandits and wild animals, although nowadays the only thing threatening them is the occasional door-to-door salesman! The grandest and largest in Gaobei is Chengqi Lou, which is four-storeys high and over 62 metres in diameter. Construction of this tulou began in the late Ming Dynasty (1368-1644) but it wasn’t completed until 1709, during the Qing Dynasty (1644-1912). It took three generations of the local Jiang family to build this spectacular tulou. In three generations, my family have barely managed to pay off a house, let alone build a fortress! Chengqi Lou is a circular tulou and is renowned for its four concentric rings; one that surrounds the complex and three within it. The first or outer ring is four-storeys high, with the ground floor made up of kitchens, the second floor acting as grain storage rooms, and the third and fourth floors being used as living quarters and bedrooms. In its heyday, this complex could support over 800 people, and nowadays it still houses an impressive 57 families and 300 people. The second ring is two-storeys high and is comprised of 80 rooms for general use. The third is only one-storey high and its 32 rooms make up a community library. After all, when you’re being besieged by bandits and the tulou is locked down, how else would you entertain yourself? Nothing like a good book to get you through a potentially hostile takeover! The final ring is just a covered corridor that surrounds the ancestral hall, where inhabitants still worship their venerated ancestors. In total, Chengqi Lou contains a staggering 370 rooms. This means that, if you spent one night in each room, it would take you over a year to get through the whole complex! 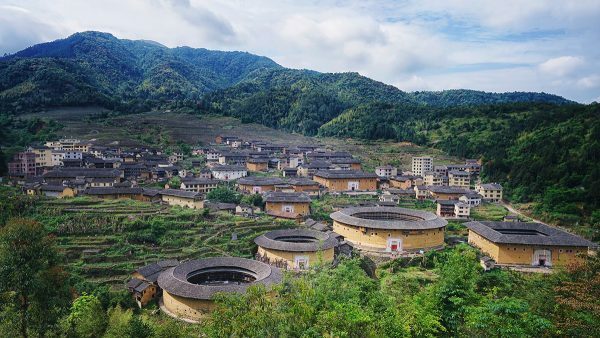 Other famous tulou in the area include Wuyun Lou, which was built during the Ming Dynasty and is currently uninhabited, and Qiaofu Lou, which was constructed during the 1960s and acts as a hotel for tourists. So if you fancy a real tulou experience, don’t forget to book a room at Qiaofu Lou. Or perhaps just squat for free in the empty Wuyun Lou!